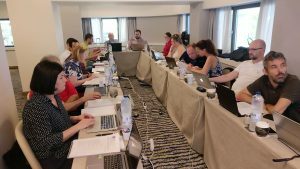 Digital Competences Development System (DCDS) is the name and the main deliverable of the project which is implemented by the consortium of eight organisations from Belgium, Greece, Italy, Latvia, Romania, and Spain. The system, fully aligned with European Digital Competence Framework for Citizens (DigComp), will be used to provide non-formal training for adults with low digital skills to improve their basic digital and transversal competences needed for employment, personal development, social inclusion and active citizenship. 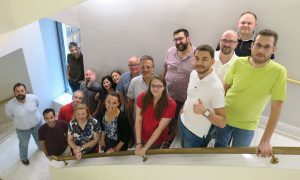 On 17-18 July representatives of partner organisations gathered in Athens for the DCDS project meeting, which was hosted by Hellenic Open University. 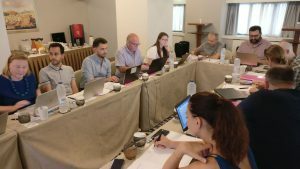 The main points of the meeting agenda were devoted to reviewing key project tasks and deliverables, including Context Analysis Report, Policy Influence Plan, and the design of Digital Competences Development Methodology. The Context Analysis Report was presented by Altheo Valentini from Centro Studi Foligno. The report is based on the research implemented at both national level (CSF and AECA in Italy, HOU in Greece, ESPLAI in Spain, LIKTA in Latvia, EOS in Romania) and international level (thanks to the networks represented by ALL DIGITAL and EAEA), with the main objective of investigating on the adoption of DigComp Framework in non-formal education for adults; andreviewing and analysing existing e-Inclusion policies based on their consistency with DigComp and other EU flagship initiatives in the field of adult education. Preliminary results of the research were presented and discussed during five national focus groups with policy makers and adult learning providers, mostly focused on the collaborative prioritization of the basic digital skills to be acquired by EU +25yo citizens in the 21st century. Then these findings were validated during a second session with selected digitally low-skilled adults – the main target group of the project. Altheo Valentini shared the key results of the report review, and partners discussed the comments received from stakeholders and experts from all project countries, all of which will be used to improve the report. The report will be finalised and available in autumn, so stay tuned. Policy influence plan workshop was conducted by Gina Ebner and Georgios Karaikos of European Association for the Education of Adults (EAEA). Georgios presented the sections of the DCDS Policy Influence Plan: policy context, objectives, target groups, allies, communication strategy, policy influence methods, timeline and resources, and next steps. Gina Ebner moderated the group activities. During the first part, partners identified the strengths and weaknesses of the document and then together analysed the comments. The second activity focused on “why and how to convince policy makers”, where each partner drafted a small personalised Policy Influence Plan for their own context and later discussed the results and got a feedback from EAEA. The simple guide on policy influence will be published on the project website soon – check it out! 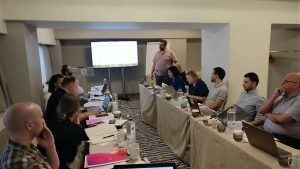 The second day of the project meeting was devoted to designing the Digital Competences Development Methodology for training adults with low digital skills – the core of the project and its main deliverable. The reviewed tasks included learning outcomes, self-assessment tool, training modules, and educational materials. Stefano Kluzer from AECA presented the results of the work AECA did on DigComp competence specification and learning outcomes. The goal of this task was to identify and specify learning outcomes for all 21 DigComp competences at level 1-2. Each DigComp competence has been «translated/specified» into several learning outcomes, with two selection criteria: appropriate for foundation level and relevant for inclusion. How to make assessment more informative? How to assess other aspects besides digital competences, such as desire to learn, interest that could drive learning, and personal assets to build upon? How to motivate users to take the training with the help of the self-assessment tool? After reviewing the approach, participants worked in groups to assess the contents of the self-assessment tool and provide written feedback on assessment questions. Another part of the methodology design is its instructional elements – training modules, as well as education material. AECA‘s Rodolfo Padroni presented the proposal of DCDS training modules. 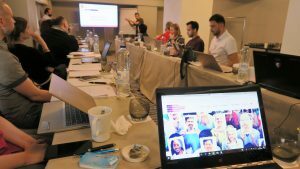 The partners agreed that there would be 21 training modules – one per each digital competences to align with DigComp. The partners were also asked to assess the module frames, including proper and complementary learning outcomes and produce written feedback, which was collected by AECA for further development. In the following months the partners will identify relevant educational material for DCDS, which has to be associated with learning outcomes. A lot of work ahead!